The day the kids broke up from school, we were off on our jolly holiday to Ibiza. This was actually our third time going as a family and Daddy Hazelden's fifth time, can you tell we love the place!!?? What I love most about Ibiza is that it caters for both families and younger people and people who want to have time out without their kids. We managed to spend our days entertaining the kids and when the evening came around my lovely mummy was on hand to babysit the kids once they were in bed so Daddy Hazelden and I got some much needed couple time. I think as our relationship has continued I have found having time to ourselves more and more important!! It is surprising how much there is to do out there and unlike in our country, everything is more than affordable. We did a different thing with the children every day of the holiday, we got to enjoy the gorgeous weather whilst keeping active too. Our first day there, the kids spent there time on the go karts, it was 1 euro a go but as you can see from the photo, we all paired up sitting on them and they went round the track a good few times before their turn ran out. I had a turn with Freya driving, I was scared for my life, she is definitely a girl racer, turning on corners at the last sec, banging into the tyres. Her older sister sped round the track, not taking her foot off of the accelerator. The good thing was, there was a bouncy castle, trampolines and a soft play area too and these were free, so both Gracie and Layla were kept entertained whilst their sister's zoomed round on their bikes. We had so much fun here that we spent our last evening here too! The second day Daddy Hazelden took the eldest two down to the beach with a couple of nets to try and catch some fish whilst Layla and Gracie were having an afternoon siesta. This meant them spending time by the sea, climbing over a rocks, a real mini adventure. Not surprisingly they didn't manage to catch anything, although you can see from the picture on the right the Elise did catch a Nannie in her net. It was really nice for them to get a bit of time alone with Daddy Hazelden as this is a rarity when we are at home. I think this may be something that they can do at home as Daddy Hazelden used to go fishing a lot so it would be nice for the girls to join in with something that he enjoys, rather than him having to play princesses!! Day three was a park day. 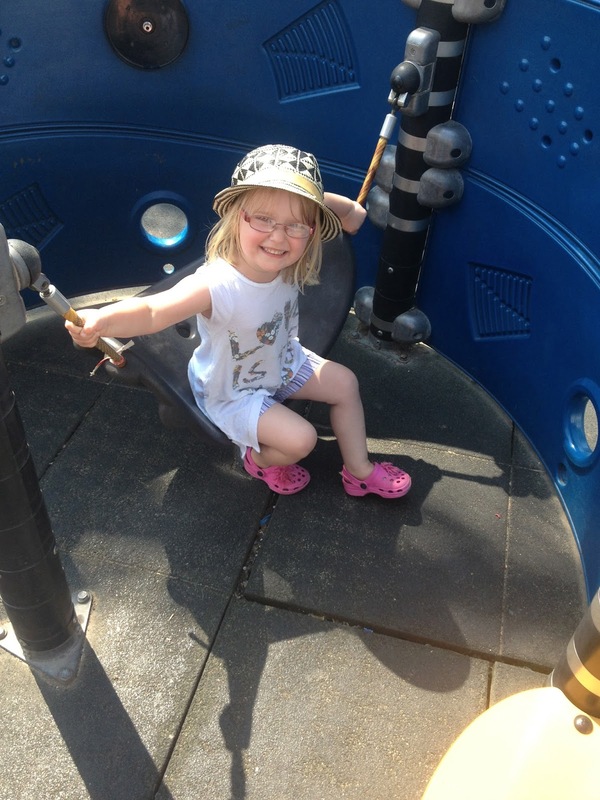 Even when away from home, the kids love going to the park, a free and simple way of keeping the kids happy. 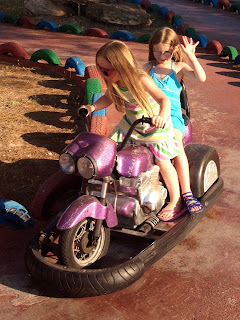 There are a lot of parks to choose from in Ibiza, literally everywhere you walk there is a different kind of park and they all cater for younger and older children. The problem is trying to find one in the shade. With the average temperatures around the 30 degree mark, if the park isn't shaded, then the park apparatus is left extremely hot, making it impossible to sit on without burning your bottom. Trust me, I attempted sitting on the slide, one word, ouchie!! Day four came. 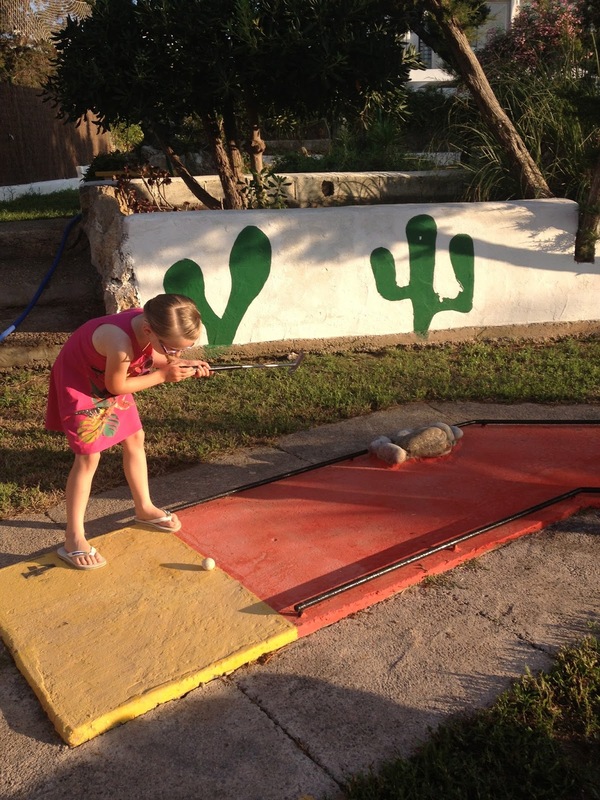 Who could have a holiday without playing a little bit of mini golf!!! Less than 20 euros for the whole family to play and there was 18 holes to get round. We decided to go in pairs, Daddy Hazelden and Elise, me and Freya and Nannie and Gracie together. Layla sat in her stroller watching and we took it in turns to push her around the course. 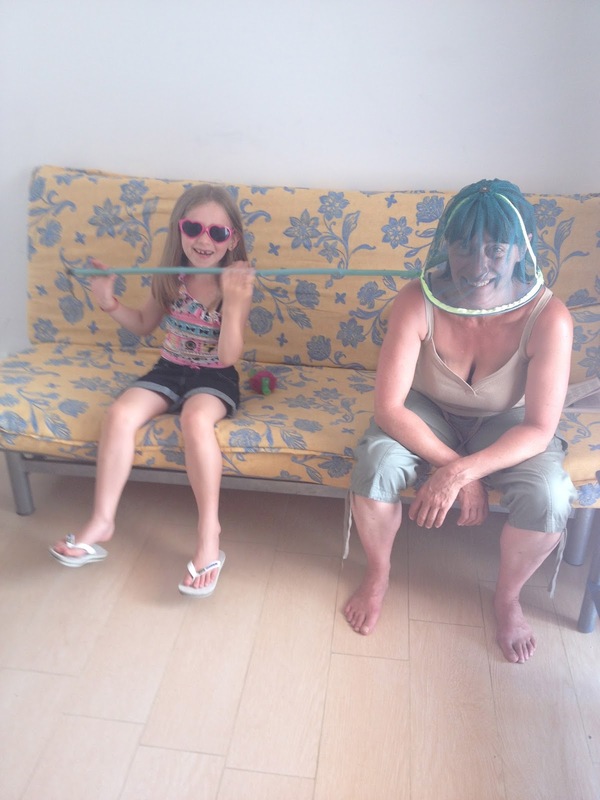 Now Nannie and Gracie won but there was a little bit of cheating here because Gracie didn't really play a lot!! It was funny watching the girls trying to hold their clubs properly and get them hitting the balls in the right direction, lets just say it took a while to get to the end of the course!! Day five we spent the day at the beach which was literally outside of our hotel. We spent a tiny 13 euros and rented out a pedlo for an hour. Daddy Hazelden ended up doing most of the pedalling but the kids took it in turns going in it with him. At one point there was Daddy Hazelden and I pedalling whilst I had Gracie sat on my lap, a tad difficult. It was nice being out in the sea, watching the ferries go by, seeing other people in their pedlos and watching people float past on their lilos, really lovely views. Pity the kids legs weren't longer so that they could pedal whilst Daddy and I laid back and soaked up the sun, maybe one day. One thing we tried to do every day, was spent at least an hour in the swimming pools. There were three pools, a bigger one more for adults, older children, a smaller shallower one and one with lots of slides and showers etc. 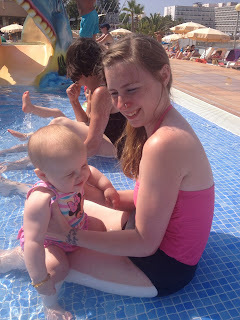 We actually spent the time trying to teach the kids how to swim and by the end of the holiday Elise was swimming along with a float, Freya was almost swimming without a float and was quite happy putting herself under the water and even little Gracie was telling everyone how she was managing to kick her legs. The one complaint I had, was that the pools weren't very warm, it was a shock to the stystem the first time I stepped foot in them!!! Layla was able to go swimming thanks to the lovely people at Bambino Mio sending me one of their swim nappies to review. These adorable nappies come in fours sizes and eight different prints. I picked the pink daisy print, so cute. However, I was umming and arring which size to get because Layla was at the top end of one and not quite in to the size that was bigger. I opted for the medium size and I was pleased that I did. What a fab fit, no gaping around the legs and a lovely snug fit around the waist. Both the leg cuffs and waist are elasiticated so made it easy for Layla to freely move around. It is so soft and Layla definitely tested it to the max. She wasn't overly keen on going into the swimming pool and it took a while to persuade her to sit down in the water but she did enjoy people watching whilst cuddling with me. She gave me a clear sign when she wanted to get out though, little monkey decided a number two was in order, but I am happy to report that it was all kept contained in the nappy and unlike disposable swim nappies, it stayed the same size no bulging and hanging down between the legs. And because it is reusable, we only needed the one nappy all holiday, more space for souvenirs in the suitcase!!! 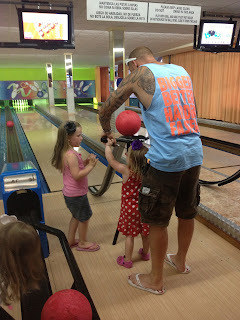 On the last day we took the kids bowling. Again amazingly priced compared to over here, 24 euros for 2 games for 6 people!! The nice thing was that there was a ramp for the kids to use to help them with the bowling, I really could have done with this myself as I am truly rubbish at bowling. Just to prove how rubbish, I came last overall and my 5 year old came first!! The best thing in Ibiza is that you don't have to wear those horrible sweaty bowling shoes!! It was a great end to an amazing holiday. It was a real shame it had to end, even the kids are asking when can we go back again and it really didn't help that we came back to rain in the UK the day we came home!! So where has everyone else been on their holidays?? What places do you recommend?? 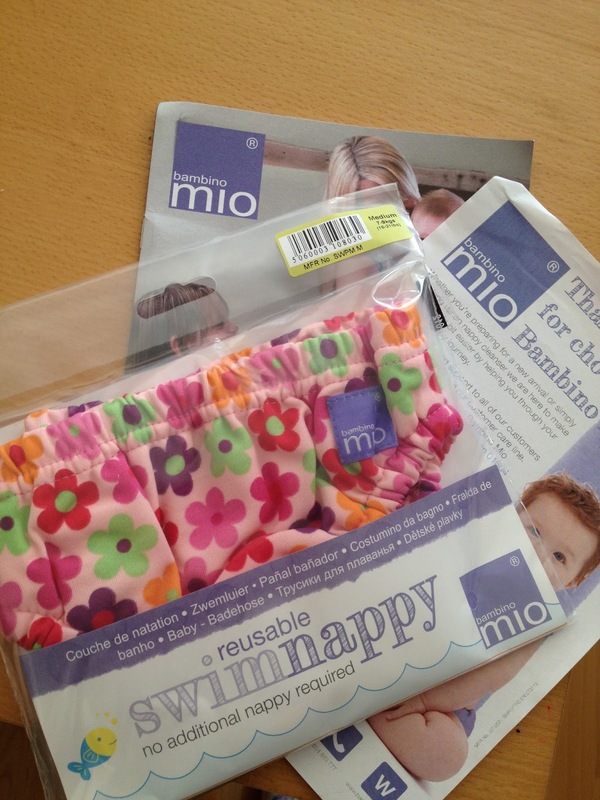 Disclaimer : I was sent the swim nappy free of charge for reviewing purposes however all thoughts and opinions are my own. I've never been to Seville before, sounds perfect!! A fab family holiday creating some lovely lasting memories for you all! You managed to do lots of fun activities with the children and at such a reasonable price, thanks for sharing your holiday fun with Country Kids. Sounds great! I'd have always steered clear of Ibiza because of how it seems on TV but my boyfriend went to a little village with his family when he was younger & said it was great. Might need to give it a go! Sounds like a really fun-packed holiday. I never would have thought Ibiza was a suitable place to take kids - I only think of all the horrible drinking and clubbing programmes you see on late night TV - enough to put anyone off! Popping over from Oldies But Goodies. lol I'm desperate to go back! !